Name:"ASA University Bangladesh Sociology Club" "ASAUBSC"
Nature: is a voluntary students organization. The result of these activities will develop leadership and strong character among those students participating in the club. It is also expected that a social side effect of these activities is to develop cohesiveness among the departmental student body. A)	All member of the club will be treated as -General Registered Member (GRM)-. B) The club will be financed by the registered club members. Fess of GRM will be 20 taka, and every month every student has to pay 20 taka for club fund, and the executive committee will pay 100 taka per month also. Every student has to pay their membership fees at the beginning of the semester to participate or contest the election. Without paying membership fee or renewal of membership no student can participate or contest in the election. There will be a moderator and some joint moderators of this club. Teachers of the department will act as a moderator or joint moderators. Departmental Head will select moderator from the teachers and all other teachers will be treated as joint moderators. a) The club will be administered in a democratic way. The executive committee members will be elected by the open or secret voting by the registered club members at the presence of moderator or joint moderators. Moderator will act as election commissioner. His/her decision will be the final one. b) The duration of each executive committee will be a maximum of 6 months (midterm exam-midterm exam). Election must be conducted within a week after every midterm examination and previous committee will hand over the responsibility to the new elected committee immediately after the election is being held. c) After the election, previous committee will hand over the responsibility to the new committee. And this committee will extend for 1 year. 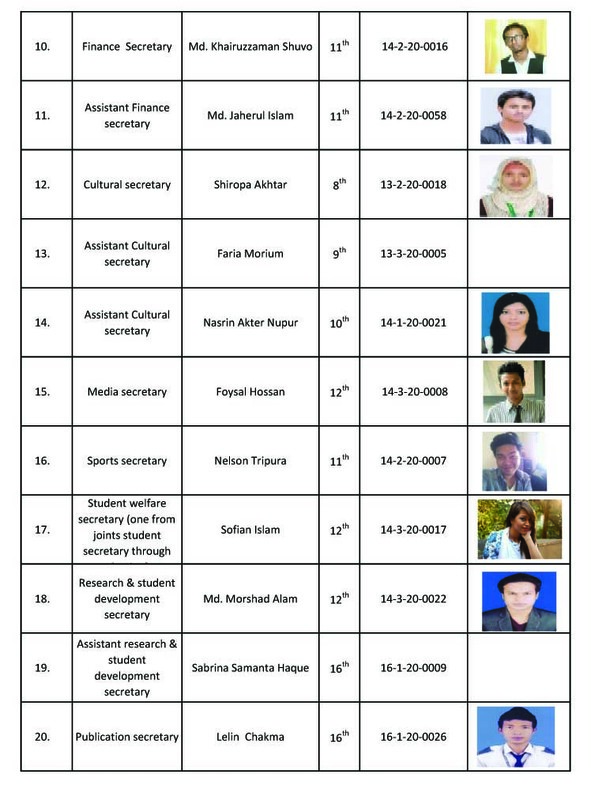 A)	Until all semesters are available (1st semester to 12th semester and more of the most senior batch will get the opportunity to be an elected president and any student of the same ornext senior batchwill get the opportunity to be a vice-president. When all semesters will exist, then president will be nominated and elected from previous committee procedures. 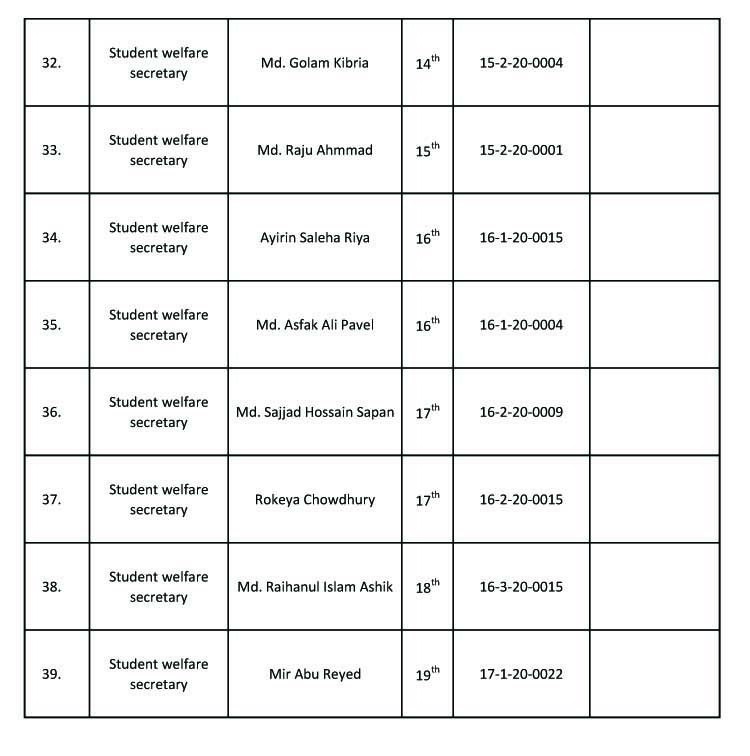 If President and Vice President are unavailable and inactive from the 12th and 11thsemesters/batches, then the students of immediate next semester/batch will be eligible for the posts. B)	President and Vice President will be treated as a member of the immediate next committee once only without election (if they will not contest for other post or same post again). C) Other posts of the club are open for all students, but a student can contest for only one post. D) . A student can be elected maximum two times for the same post. E) If there is only one contestant for a specific post, he/she will be declared as elected. F)	If there is unavailability of any candidate(s) for any post(s), moderator can select any general member of the club for the post(s) after consulting with joint moderators. A )	If any member of the executive committee become unable to perform his/her assigned job then he/she will be accountable to the president for explaining the reason and the president can take action against the cause by consulting with moderator. B )	After completing degrees (BSS), general membership of a student will be terminated and automatically will be into Advisory Panel of ASAUBSC. 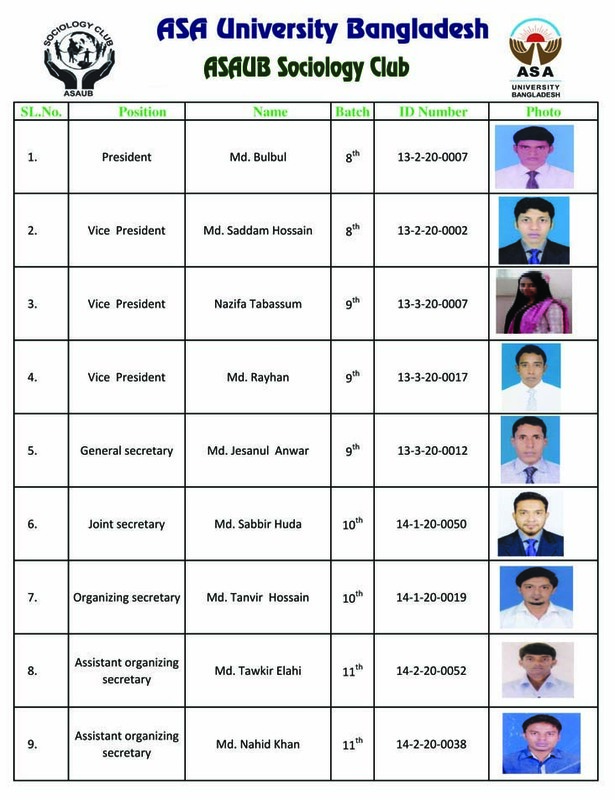 C )	If a student becomes a member of any other executive committees of ASA University Bangladesh, he/she cant contest for any executive post except -executive general member- or after elected an executive committee member of ASAUB Sociology Club, he/she cant be a member of any other executive committee member of any other organization(s) of ASA University Bangladesh, in such case the post will be treated as vacant. D )	No one can raise any question(s) regarding the law, constitution and the decision taken by the head of dept., moderator and join moderators. If does, membership will be cancelled. E) Department has every right to dismiss or declare cancel any executive committee member (i.e., president, vice president, etc.) at any time due to any kind of misconduct, misbehave etc. In such case, committee will decide who will perform in his/her duties till next election. F) Department has every right to dismiss or declare cancel any executive committee member (i.e., president, vice president, etc.) at any time due to any kind of misconduct, misbehave etc. In such case, committee will decide who will perform in his/her duties till next election. G) For any misconduct or misbehave or any other reasons; moderator, join moderators and head of the dept. have the right to dismissed the president, vice president and any other executive members from their post at any time. H) The club member(s) will not act in such a way that may harmful for the student(s) or image of the club, if anything found wrong then moderator and join moderators have the right to cancel his/her membership. A ) Any decisions will be taken through executive committee meeting. Final approval will be given by the moderator or joint moderators. B ) To conduct any meeting, moderator (or his/her representative) or joint moderators, and 60% of total executive committee members must be present. C ) All decisions must be written and signed by the present executive committee members. Moderator and joint moderators will have every right impose veto against any decision; if they do so then the decisions will be treated as invalid. A ) Moderator and/or joint moderators will collect fees from the students and elected treasurer will keep the records of expenditures. Moderator/joint moderator can ask help from students/members for this purpose. An account will be open and maintained jointly by the moderator and departmental head. A ) Moderator has every right to dissolve the club at any time without showing any reason/cause. D )	Suggest any changes of constitutions. E ) Play the role as an Election commissioner and he/she is responsible for all activities related to election. F ) Announce dates for new/renew of membership. Main responsibility of joint moderators is to help moderator in any aspect. Moderator will assign duties/responsibilities to the joint moderators. Joint moderators can play roles as a convener to a specific subcommittee(s). B ) Take initiative and arrange different programs related to students. C ) Make decisions regarding any activities through executive committee meeting. D ) Monitor and control club functions/programs. E )	Form subcommittee(s) to arrange any programs. F ) All executive members will be responsible for their job to him/her. 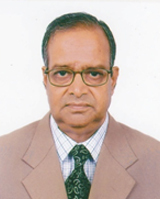 Vice President of the executive committee is the honorary post. He/she will act as President in charge if President will absent or the post become vacant. When vice president will act as a president, he/she will be responsible for all activities assigned for the president. After directed by the President, General Secretary will call executive committee meeting by communicating all executive committee members through written invitation letter. Every member must be informed about the meeting. General Secretary will keep records about the decisions of the meeting in written form and take signatures of the members who participated the meeting. 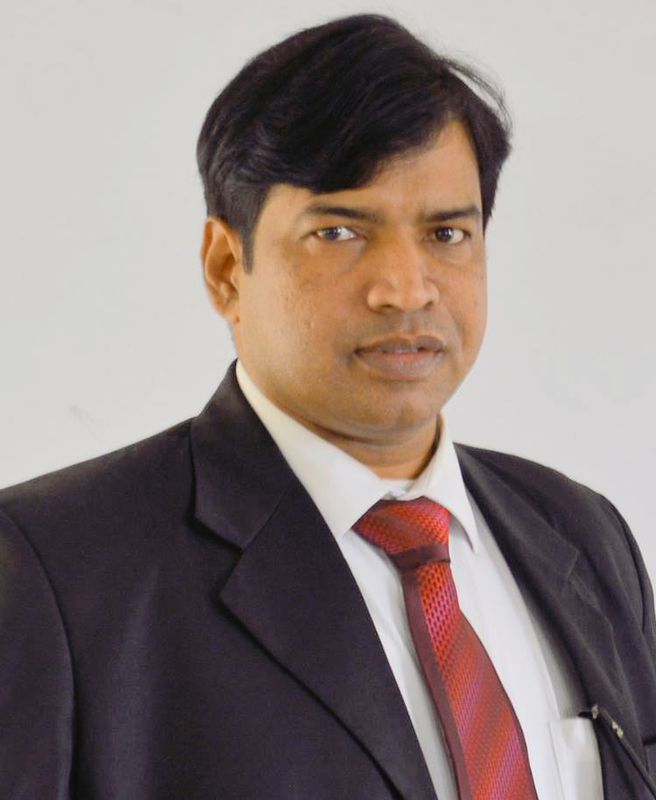 He/she will be responsible to perform their duties to the specific section as per the decision taken by the committee. Treasure is responsible for to collect money from the students and keep records of expenditure. He will place a statement of income and expenditure during his/her tenure to the next committee. If any fees for any program will be imposed by the committee, the treasure will collect fees through student secretary and handover the money to the moderator or deposit the money into the account. : He/she will be responsible to perform their duties to the specific section as per the decision taken by the committee. 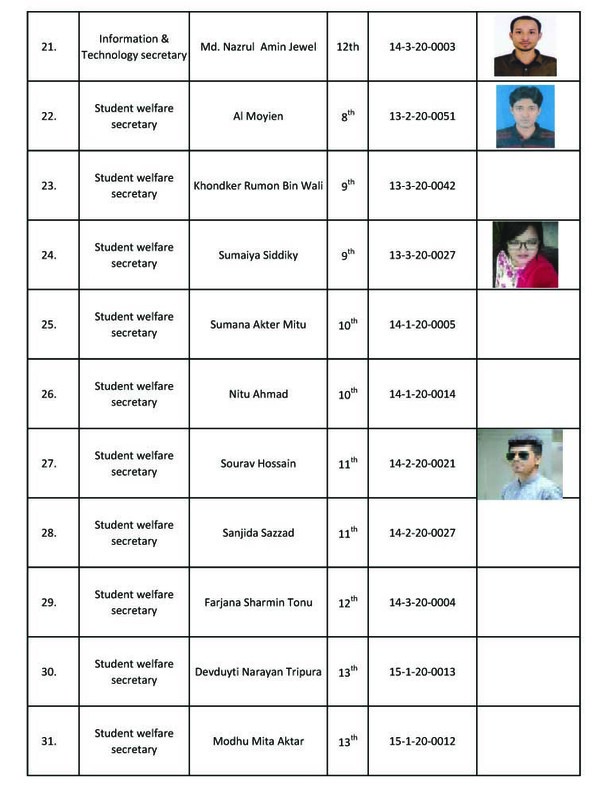 Student welfare secretary will be elected from all class representatives. He/she will responsible to all activities related to communicating with the general students or members of each semester through joint student secretary. He/she will also responsible to monitor and coordinate to collect fees. Joint Student secretary is a non-electoral post. Every class representative will be treated as assistant student secretary. They will responsible to assist student secretary and perform their duties. They will be responsible to perform their duties to help the students skill development and research related assistances decided by the committee. They will be responsible to perform their duties to the specific section as per the decision taken by the committee.